Early on Thursday morning we passed Point Barrow at the northwestern extremity of Alaska. 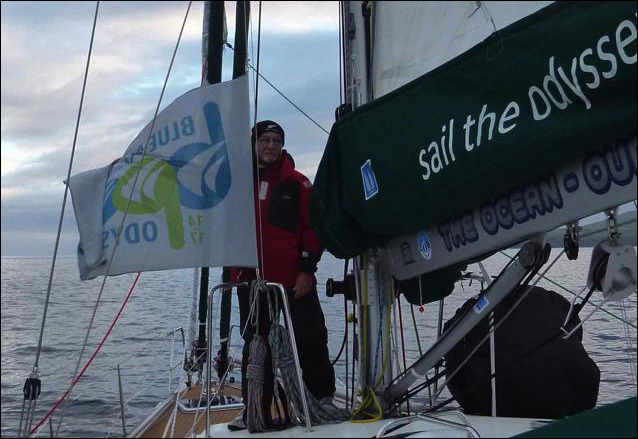 In the month since we left Seattle we have logged 3,000 miles and have now reached an important landmark on our current expedition as we now turned east towards the distant Atlantic. At 71 degrees 23 minutes North, this is the farthest north you may wish to sail as there is nothing between here and the North Pole. What lies between where we are now and the pole is the polar ice cap now rapidly shrinking at an unprecedented rate because of climate change. 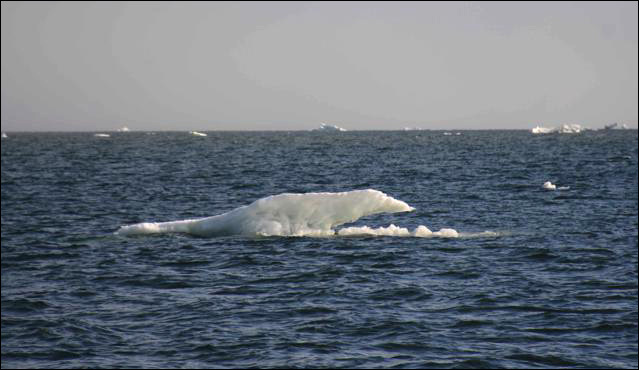 We had a first taste of that soon after we had turned that symbolic corner, as we found our route barred by more and more ice that had broken off the ice cap and drifted south, from small icebergs to large floes, bergy bits to growlers of all shapes and sizes. Fortunately the concentration is not high enough to stop our progress, although we have to continually slalom and zig-zag to avoid the obstructions that bar our way. This is in quite easy in good visibility, but rather hairy when we are enveloped in mist and can only see one or two boat lengths ahead. At this latitude we have permanent daylight, and, as the sun got higher at 0400, it burnt the mist and I could take a photo of this iceberg that resembles a crouching figure. It was not its shape but the dark coating that drew my attention as I supposed it could be only the result of pollution. So it is not just the atmosphere getting warmer towards the pole, but even such once pristine areas show the effects of just how far air pollution has reached. And if this is the case in an uninhabited area, just imagine what we are breathing in places like London or New York, not to speak of Shanghai. My favourite ice creation of the day: is it a crocodile, the giant Komodo lizard… or a dinosaur frozen in time? 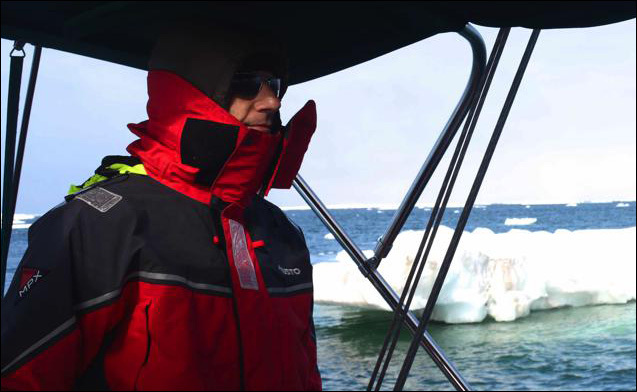 I hope that those of you who followed my last year’s adventures know that Aventura’s presence in the Arctic is as part of the Blue Planet Odyssey and its aim to raise awareness of climate change. Meanwhile, my daughter Doina is flying the Blue Planet Odyssey flag at this very moment in Tuvalu, the first nation threatened to lose their ancestral home as a consequence of climate change. You can read all about Doina’s current visit to Tuvalu in her own words on our website. 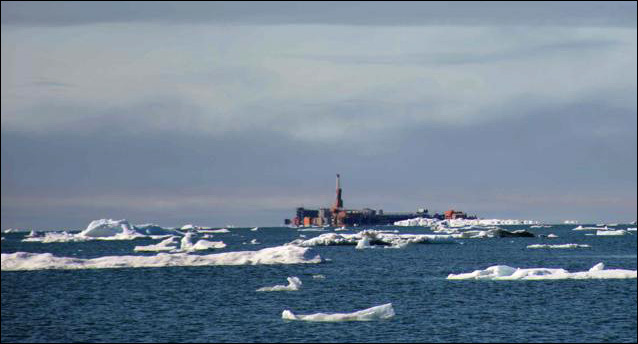 Back in the Arctic, today is a beautiful sunny day, with blue skies and yes, ice everywhere… but as I was writing this report our attention was drawn to some oil rigs spiking the far horizon. As we got closer we realized that this must be Prudhoe Bay, reputed to be the highest yielding oil field in the US… And while we were in Dutch Harbor a Shell drilling platform was on its way to commence work in the High Arctic. Times are indeed a-changing, and – purely as nature is concerned – I doubt that it is for the better.